Note: This commentary has been updated to incorporate the November data for Industrial Production. Today's report on Industrial Production for November shows a 0.6% increase month-over-month, which was worse than the Investing.com consensus of 0.3%. The year-over-year change is 3.9%, down from last month's YoY increase. Revisions were made to the previous five months. 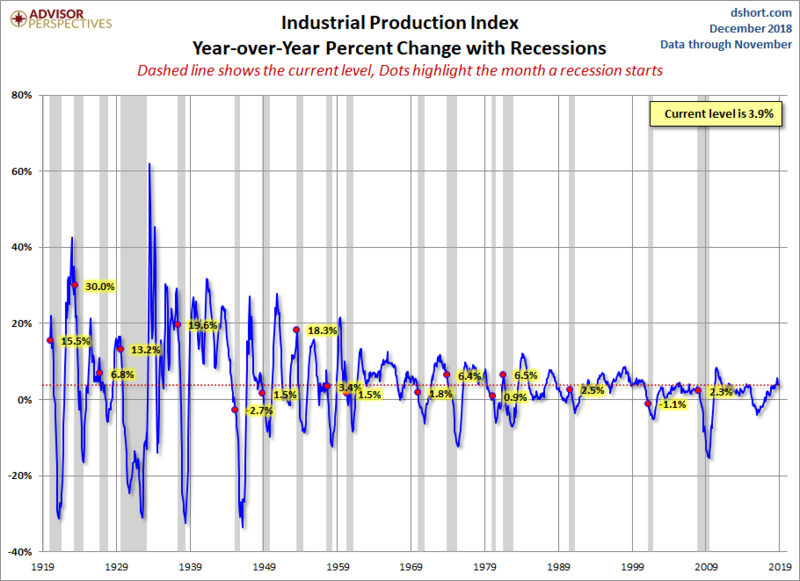 The chart below shows the year-over-year percent change in Industrial Production since the series inception in 1919, the current level is lower than at the onset of 8 of the 17 recessions over this time frame of nearly a century.